I spend an incredible amount of time commuting these days, which means that I’ve gotten really into podcasts. Apropos of nothing, I figured other pod-heads would perhaps enjoy a few recommendations. Here are my five current favorites, in no particular order and ranging from the educational/useful to the macabre to the ridiculous. Co-hosted by attorney/writer Josie Duffy Rice and scholar/author Clint Smith, Justice in America is the best podcast available that explores the complexities of the American criminal justice system and the terrible burdens it places upon poor people and communities of color. Rice and Smith get great guests (the most recent episode features the incredible abolitionist Mariame Kaba, while previous ones have featured John Pfaff, Ta-Nehisi Coates, and others), but the two of them are also incredibly insightful and knowledgeable on their own right. With episodes dedicated to everything from money bail to public defense to the bipartisan creation of mass incarceration, this is a must-listen for anyone who wants to better understand the the justice system. 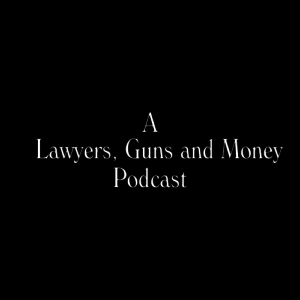 I write about the justice system for a living and learn new things every episode. Co-hosted by comedy writer Nick Wiger and actor/writer Mike Mitchell, Doughboys is a hilarious podcast about chain restaurants that routinely veers hard into such subjects as Star Wars, video games, and other absurdities. Each episode is dedicated to one particular chain restaurant (from the fast food to fast casual to chain steakhouses), which Wiger and Mitchell and a guest review. What really makes the show, however, is the relationship between the two hosts, both of whom are hilarious and distinctive and who have, over the nearly four years of the podcast’s existence, cultivated a dynamic that is deeply, deeply funny. (Because that dynamic took time to evolve, I recommend starting with episode 1, even though the early episodes are a little slower.) This is the podcast that I prioritize above all others when a new episode is released. Look, I’m a historian. Of course there was going to be a history podcast on here. (The Dollop is also great, but very different. A history podcast by comedians.) Backstory is co-hosted by a foursome of esteemed historians: Ed Ayers, Joanne Freeman, Nathan Connolly, and Brian Balogh. Each week, some combination of the four, alongside other professional historians that they interview, examines the backstory of current news events by digging into one or more historical episodes that help explain the present. The stories they tell are often funny or just plain weird (the man who wanted to stuff the Founding Fathers to preserve for posterity), contemplative (an entire episode on the history of solitude), and infuriating (a recent episode on the history of blackface). Given the LGM readership’s general interest in history, this is likely a podcast for many of you. Taking its name from Chicago’s famed Washington Square Park–which got its “Bughouse Square” moniker from its famous legacy of soapbox orators, poets, artists, radicals who would ruminate on all manner of things from its environs–the Bughouse Square podcast is pretty remarkable. It’s formally hosted by author/poet/sociologist/activist/comic book author/general badass Eve Ewing, but in some ways it feels like it’s a co-hosted podcast between Ewing and the late, legendary oral historian Studs Terkel. The podcast was developed by a partnership between the Studs Terkel Radio Archive and the Chicago History Museum, and the premise is this: each episode features sections of interviews that Terkel conducted with a particular individual. Interlaced between those sections of audio is commentary by Ewing, as well as interviews by Ewing of notable individuals from our present moment that complement the person that Studs was interviewing back in the day. The first episode, for example, featured Studs interviewing James Baldwin, mashed up with Ewing interviewing Darnell Moore, author of the extraordinary memoir No Ashes in the Fire: Coming of Age Black and Free in America. Other episodes from Bughouse’s all-too-brief first season feature Studs w/ Lorraine Hansberry (Eve w/ Imani Perry), Shel Silverstein (Adam Mansbach), Sandra Cisneros (Erika Sánchez ), and Younghill Kang (Min Jee Lee). What an absolute joy and incredible accomplishment this podcast is. There’s none other quite like it. Of course, comments can be about all things podcast. Would love further recommendations.